Major General George Smith Patton IV (December 24, 1923 – June 27, 2004) was a senior officer in the United States Army and the son of World War II general, George S. Patton, Jr.. He served in the Korean War and the Vietnam War. Ever since I was a child I never wanted to be anything else but a soldier. He had an instinct for doing the right thing at the right time in combat and many American soldiers are alive today because George Patton was their boss. Heavens, the first poem he ever learned was, 'Hats off, the flag is passing by.' I remember a little boy with a paper hat on marching around. A soldier was all he ever wanted to be. I don't think he could have done anything else. George, the Army needs someone like you right now. You can't quit. I'd follow that man to hell and fight the devil himself 'cause I'm damn sure he'd lead me back. I don't know how long this thing will last... We can still lose this war. That's a real clear statement. I wouldn't be a goddamned bit surprised but that we can still lose it. And then you can just write those casualties off and those ever-increasing names on those ever-increasing monuments... You can keep putting them on the monuments and giving out all this crap, all this posthumous DSCs and Purple Hearts... but there's no end to this thing. Christ, I'm busy and there's a lot of people who wanna give me parties and I've got to go and say good-bye to the troops. And Jesus, we've got some great troops here, just great. I'm so kinda sad leaving them, just kinda sad. I was sittin' in the chopper today and I just bawled my goddamn head off, I just did. Funny... It isn't that I don't want to come home; I want to come home and I'm sick of this war a little bit. But leaving this unit is tough, and that's all there is to it. In each generation, as long as we are to remain a great nation, a group of us are somehow chosen, perhaps by the Almighty, to serve our country and our army and to serve the nation. Perhaps it is a small group, woefully inadequate, but it is there, and regardless of how we see it, regardless of the dwindling budget, the ancient outdated tanks of the 1920s and equipment, the congressional pressures to cut, cut, cut, that group will stay, and as the poet said: "Some for honor, and some for pay." I've got to say the soldiers in Vietnam that I was associated with in my three tours, who were pretty much front-line troops, were the best I'd ever seen on any battlefield. The soldiers were up against some incredibly difficult rules of engagement. I'll tell you a story. It's a real good story. We had some villages to run civic action and medical help in. My engineer company built a school. We were in the village of Binh My, and we got some lumber to rebuild a schoolhouse. We were about two thirds of the way completed. We had a teacher hired who was a cripple. My engineer company was bringing in the supplies in an armored personnel carrier along the little road up to the schoolhouse and they hit a mine. Luckily nobody was seriously injured. Well, the engineers went out there and fixed the armored personnel carrier, and then continued right on building the school. I went up to them and said, "You all are pretty complacent about this." And they said, "Sir, that's our job." There's no way of telling who laid that mine. But it was someone who didn't want us to build that school. They knew we used that little trail. But we just went right on. Kim Willenson: "You've been described as 'utterly fearless.'" George S. Patton IV: "Who, me? Who the hell said that? Everybody's afraid, but to do your job in combat you have to put your fear down. If you're not afraid in combat, you're either a fool or a liar. I'd go back to the Army tonight if I could. I loved the people, the life, the fellowship, the travel. There was nothing about it I didn't like, except my tour in the Pentagon. I liked my tours in Vietnam because I felt I served my country in the way I'd been trained to do. Let's put it this way, a violinist who doesn't have a violin is going to be a lousy violinist. A soldier who does not participate in his country's wars is not a very good soldier. I didn't realize we were going to lose until I was well at home. You've got to understand that I came home in '69. But in May '75 I sat in front of the television set and watched all that fighting along the Saigon Bridge and the final death throes of the South Vietnamese, and the pictures of them throwing the helicopters off the carrier, and I bawled. I cried." While I was never over-romanced by the West Point graduate, at the same time, I always felt, by God, a West Pointer ought to be damn good. It was one of those hot days and it got to be about a hundred degrees, and old Mike just got fed up and threw his books in the corner, and said, 'See ya later, Doc, I'm going to war.' Next thing we heard, he was in Italy with the 3rd Division, where he later was awarded the Medal of Honor and received a battlefield promotion. A great transformation came over West Point. Many of the staff and faculty who had been there previously were non-combat experienced and had been called up from civilian life. Then in came the new superintendent, General Maxwell D. Taylor, who brought to the Department of Tactics a collection of the finest officers that I have ever known before, or since. The lessons of West Point are many, but the Academy has been the source of discipline, courage, and strength for many of its graduates in both peace and war since its founding in 1802. My father came to visit and spent about half a day with me during a weekend. At the time, September 1942, he was in a highly classified planning program for the attack on Morocco at Casablanca. He was unable to tell me anything about the operation, except that this would be the last time he would see me before going overseas. He said that I was not to tell anybody that he was going overseas, but that he was leaving soon. Of course, in those days, you didn't have too many privileges as a fourth classman, and besides there were so damned many generals at West Point, and in the Army, that his appearance, as I recall, didn't cause any particular stir. At the time he was a major general and had recently been training in Indio, California. I went home and stayed at Green Meadows. A couple of days later we all went up to Boston and the aircraft landed. I'll never forget it. My dad got out of the aircraft and he really looked super; he was fifty-nine years old at the time. WIth him in the aircaft were a couple of division commanders, including John W. O'Daniel, who had lost his son in the Normandy invasion and who later became my commanding general at the Infantry School at Fort Benning when I went through the basic officers course in 1946. Also aboard was Leon Johnson [USAF], who had been awarded the Medal of Honor for the Ploesti Raid, followed by eight or nine noncoms, not one of whom was wearing less than a Silver Star. All of this was followed by a ticker-tape parade through Boston. That evening my father spoke at the Shell on the Esplanade in Boston. We came home that night quite late and the next morning he came upstairs and woke me up and said we were going for breakfast. I ate breakfast with him and then I got on a train and went back to West Point. It was the last time I ever saw him. I was right in the middle of examinations when they called me up into the Tactical Department Office. Colonel Russel "Red" Reeder told me what had occurred. He went on to explain that my father had suffered a broken neck and was paralyzed. He also said that they were in communication and would keep me informed. I wwent back to my room and wrote a cable which I went on December 10, 1945. It said: All of us here are praying for your speedy recovery and return home. I know you can do it. Your affectionate son. George. I was still in Europe at the time. Truman said he had the authority to relieve him and he did it. I have never made up my mind whether he was right or not, but I happened to be with a British unit the night we learned of MacArthur's dismissal. The British had a brigade in Korea at the time and the British officers in the Mess were very anti-MacArthur and celebrating his demise. I think MacArthur was a magnificent general, but he became more and more insulated from the world by his staff, many of whom had been with him since the Bataan days. I think that was part of the problem. He was not a young man at the time of Korea. I think, perhaps, he got too dependent on his staff officers and certain things happened which were not in MacArthur's best interest... Even after MacArthur was relieved by the President of the United States he had a tickertape parade in New York City and he made two great speeches, one to Congress and one about Duty, Honor, Country. The Duty, Honor, Country speech is one of the greatest ever made by a military man, and he made it without a note at the age of seventy-five. I believe Douglas MacArthur in 1945 could have come home and run for president and won going away. He was worshiped at the end of the war. Prior to Ap Bac, the Kennedy administration had succeeded in preventing the American public from being more than vaguely conscious that the country was involved in a war in a place called Vietnam. No officer I ever met, either above or below me in rank, could touch General Creighton W. Abrams. He was the best soldier I have ever known, including all the members of my family. The connecting file between the old and the new- George came to West Point in 1942 steeped in Army tradition. Like his father, who commands the Third Army, George commands any situation that comes his way, be it femmes, boodle or a falling out dumbjohn. He has held up his end of the family rank, first becoming sink sergeant and then a high ranking corporal. His motto has always been: The Army first, my fellow man second, me third. The Army retains a soldier, an athlete, a gentleman. For as long as I can remember, I knew that my father labored under the weight of his name: When you're the only son of a legendary yet controversial war hero and you choose to dive into his profession, what do you do next? The pressure was enough to drag anyone under: At my father's graduation from West Point, a guy famously walked up to him and said, "Well, George, you'll never be the man your father was, but congratulations." My grandfather notoriously slapped two shell-shocked soldiers. A decade later, my father, in turn, savagely beat a young lieutenant who'd deserted his foxhole during a battle. Both men were products of their time, when PTSD wasn't even in the vocabulary. I always had the feeling he thought he let Daddy down by not becoming Jesus Christ II. Maj. Gen. George S. Patton III is the son and namesake of "Old Blood and Guts" of World War II fame. 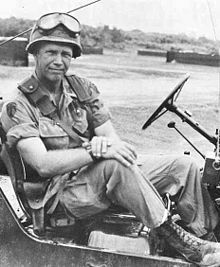 The younger Patton fought in both Korea and Vietnam, where he served three tours between 1962 and 1969. His last assignment there was as commander of the 11th Armored Cavalry Regiment, which his father had led during its horse cavalry days. Retired from the service, Patton raises produce, blueberries, and cattle on a piece of land he inherited from his family in Hamilton, Massachusetts. Kim Willenson, The Bad War: An Oral History of the Vietnam War (1987), p. 78. NOTE: Patton was christened George Smith Patton, IV when he was born, but dropped the Roman numerals from his name following his father's death in 1945. He never went by the name George Smith Patton, III, a name only applicable to his father, who was the third person to named George Smith Patton. I hereby consent to the acceptance of my son of his conditional appointment as a cadet in the military service, and he has my full permission to sign articles binding himself to serve the United States eight years, unless sooner discharged. Signed: G.S. Patton, Jr., Major General. George need not worry about missing a war. The next one is on the way. Patton looked like his father and had similar mannerisms. Their speech was somewhat alike as well. It was pretty evident that young Patton was the son of the old man. However, the impressive thing about George is that he didn't concern himself with his last name. He went out and made a career, earning everything on his own... He did a very good job in command of the 11th ACR and handled himself professionally. It's quite a burden the son of a senior officer has to carry and I must say, to his credit, he did it well. Because down through history, when you look at the sons of famous people, they were not all winners. Patton asked him to go aboard a chopper equipped with a loudspeaker and order his men to surrender. The prisoner quickly refused, and Patton said to him, "If you don't go up in the chopper with me and ask them to surrender you have personally signed their death warrants, because I will be forced to obliterate this position." The NVA captain again declined, and Patton's frustration was evident. He glowered at the man, and said, "Goddamn it, who is winning this war?" "You are," as the reply. "Then in that case," Patton shouted, "why don't we save the lives of your soldiers and let us take them out and feed them and medicate them?" "Sir," he said, "you didn't ask who would win this war." "Well, who is going to win this war?" Patton snorted. "We will," the prisoner said forcefully, "because you will tire of it before we do." Exchange between Patton and a North Vietnamese Army officer in December 1968, p. 167-168. Joanne H. Patton, p. 188. Joanne said this to her husband when he was writing out a letter of resignation, considering resigning from the Army amid frustration with, among other things, racial troubles in the Army in 1970. After asking what he was writing, Joanne took the paper and tore it up. This was the only time Patton seriously thought of resigning. The President of the United States of America, authorized by Act of Congress July 9, 1918 (amended by an act of July 25, 1963), takes pleasure in presenting a Bronze Oak Leaf Cluster in lieu of a Second Award of the Silver Star to Colonel (Armor) George Smith Patton (ASN: 0-28685), United States Army, for gallantry in action while engaged in military operations involving conflict with an armed hostile force on 9 August 1968 while serving as Commanding Officer, 11th Armored Cavalry Regiment in the Republic of Vietnam. On this date, elements of the 11th Armored Cavalry Regiment, assisted by the 1st Battalion, 8th Army of the Republic of Vietnam Regiment, were conducting a cordon and search operation in the village of Chanh Luu, Binh Duong Province. During the operation, the Army of the Republic of Vietnam troops performing the actual search encountered stubborn resistance by communist forces fighting from tunnels hidden under the village and progress was halted by hostile grenade attacks which inflicted a number of casualties upon the troops. At this time Colonel Patton intervened in the firefight, encouraging the Army of the Republic of Vietnam troops to continue their assault of the tunnel complex. Unable to find a fragmentations grenade, Colonel Patton obtained a smoke grenade from one of the Army of the Republic of Vietnam soldiers. Directing his Sergeant Major and S-2 to direct covering fire, Colonel Patton, totally disregarding his own personal safety, advanced upon the enemy position. As hostile forces attempted to launch another grenade attack from the tunnel entrance, Colonel Patton fully exposed himself to the full intensity of their fire, and threw the smoke grenade into the tunnel opening forcing the enemy force to break contact and enabling the friendly unit to secure the hostile position. Colonel Patton's courage and exceptional planning resulted in 16 communists killed and the capture of 99 Viet Cong suspects, one RPG-2 Rocket Launcher, 21 RPG-2 rocket rounds and numerous small arms and small arms ammunition. Colonel Patton's outstanding leadership abilities, unwavering devotion to duty and profound personal bravery while under hostile fire were in keeping with the highest traditions of the military service and reflect great credit upon himself, his unit, and the United States Army. The President of the United States of America, authorized by Act of Congress, July 9, 1918 (amended by act of July 25, 1963), takes pleasure in presenting the Distinguished Service Cross to Colonel (Armor) George Smith Patton (ASN: 0-28685), United States Army, for extraordinary heroism in action in connection with military operations involving conflict with an armed hostile force in the Republic of Vietnam, while serving with Headquarters, 11th Armored Cavalry Regiment. Colonel Patton distinguished himself by exceptionally valorous actions on 5 September 1968 during a battle with a North Vietnamese Army force near Chanh Luu. From his command and control helicopter Colonel Patton saw a force of fifty-eight hostile soldiers attempting to escape his troops' encirclement. He immediately directed his door gunners to engage the communists and ordered his pilot to land in the vicinity of the enemy element. As the aircraft touched down it was damaged by an intense barrage of hostile fire from a deep, well concealed ravine. Aided by helicopter gunships, Colonel Patton led an assault against the North Vietnamese positions which forced the enemy to withdraw. A three-man rocket propelled grenade team remained behind to cover their retreat. When a platoon of infantry arrived to assist him, Colonel Patton led a squad into the ravine and directed an assault on the hostile position. During the fierce engagement Colonel Patton captured one of the aggressors, and the other two were killed as they tried to flee the ravine. Colonel Patton's extraordinary heroism and devotion to duty were in keeping with the highest traditions of the military service and reflect great credit upon himself, his unit, and the United States Army. The President of the United States of America, authorized by Act of Congress, July 9, 1918 (amended by act of July 25, 1963), takes pleasure in presenting a Bronze Oak Leaf Cluster in lieu of a Second Award of the Distinguished Service Cross to Colonel (Armor) George Smith Patton (ASN: 0-28685), United States Army, for extraordinary heroism in action in connection with military operations involving conflict with an armed hostile force in the Republic of Vietnam, while serving with Headquarters, 11th Armored Cavalry Regiment. Colonel Patton distinguished himself by exceptionally valorous actions on 24 September 1968 while directing a sweep around the village of Chanh Luu conducted jointly by the 36th Army of the Republic of Vietnam Rangers and Troop B of his 11th Armored Cavalry Regiment. Intense automatic weapons and rocket-propelled grenade fire from a house destroyed an assault vehicle and wounded several men, including the Rangers' commanding officer. Seeing that the Ranger unit was beginning to lose momentum, Colonel Patton had his command and control helicopter land in the middle of the embattled area and left the ship to rally the Vietnamese soldiers. Exposing himself to the hostile fire raking the area, he maneuvered them back to a supporting position near the enemy stronghold and directed his troops to more defensible terrain, while personally engaging the communists with his grenade launcher. He then led a charge which destroyed the house and revealed a heavily fortified bunker that had been concealed by the building. Ordering his men to lay down a base of fire, Colonel Patton crawled through the open terrain until he was at the fortification's entrance and hurled a grenade inside. When the enemy in the extensive and well protected bunker continued to resist, he assaulted a second time with two other men and placed TNT in the emplacement, annihilating the position. Colonel Patton's extraordinary heroism and devotion to duty were in keeping with the highest traditions of the military service and reflect great credit upon himself, his unit, and the United States Army. The President of the United States of America, authorized by Act of Congress, July 2, 1926, takes pleasure in presenting the Distinguished Flying Cross to Colonel (Armor) George Smith Patton (ASN: 0-28685), United States Army, for extraordinary achievement while participating in aerial flight while serving with Headquarters and Headquarters Troop, 11th Armored Cavalry Regiment in the Republic of Vietnam during the period from 17 March 1969 to 27 March 1969. This page was last edited on 5 April 2018, at 22:29.